The New Leica DISTO™ revolutionizes the way of handheld laser distance measuring! Whether you need to create as-built documentations, calculate roof dimensions, integrate data into BIM or CAD software – the Leica DISTO™ S910 calculates the measures of any distance between two points from one location. Measure anything from anywhere - no matter what shape, how complex or how hard to reach! The Leica DISTO™ S910 is the world’s first laser distance meter with the revolutionary P2P Technology providing substantial application benefits to solve complex measuring tasks. Without any surveying knowledge create realistic object visualisations and high levels of fast and accurate documentation. Transfer measurement instantly to PC’s, smartphones and tablets via WLAN or Bluetooth® Smart technology. Alternatively save the results and pictures on the device as DXF data and download later with the USB interface for use in CAD software. The fully digitalized workflow saves valuable time. Using this innovative technology allows you to measure the distance between any two points from one position quickly and easily. To enable this, the Smart Base of the Leica DISTO™ S910 features new types of sensors that make angle information available. This new feature allows you to measure a number of points to form a boundry of an area that you are interested in. The DISTO™ S910 will then calculate the size of this area allowing for accurate costing of jobs. You now have the ability for your measurements to be transferred and drawn directly into your own CAD software on-site to create amazing 3D models. Once paired using the free plugin simply select your CAD drawing command and layer and start drawing. Current plugins available - AutoCAD® and BricsCAD®. If you do not wish to draw straight into a CAD program you can simply store your measurements on the DISTO for later use. You can save up to 30 points per file in 3D and then export the measurements as a DXF file .The S910 will also capture and store photos of each point to allow you to assign and results afterwards. Simply connect you DISTO via the UBS cable provided to download your saved files directly onto your laptop or computer for further processing. If In the same way as you can measure areas on the ground you can also measure hard to reach areas such as roofs and walls making this the ideal tool Roofing, Solar PV, Builders, Scaffolding & Painting companies alike. Measurement data can be conveniently and accurately transferred using the integrated Bluetooth® Smart Technology instead of WLAN . The free app Leica DISTO™ sketch 2 supports the creation of basic ground plans or tables on iPhone or iPad & Android. Dimensions can even be entered onto photographs with no effort whatsoever. The camera function on the Leica DISTO™ S910 can be used to create pictures or screen shots for record purposes, which can then be downloaded to a computer via the USB interface. Thus no details about the measured target points need be lost. 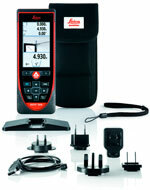 The Leica DISTO™ S910 touch offers a number of indirect measuring functions. Due to the specially developed tilt and rotation sensors the results are very precise. Even more accurate results can be achieved using the Leica FTA360-S tripod adapter with fine drive because this adapter allows exact targeting. Using this function, the Leica DISTO™ S910 displays distances and height differences to an established reference point. This makes it easy to quickly make profile measurements, without having to use more expensive measuring methods. Also, this function can be used to check whether cross beams are straight, the levelness of existing floors, among other applications. The new Leica GZM3 target plate is the perfect solution for those users who wish to use the Leica DISTO™ S910 as a templating tool. Simply place this target over the edge of the item to be measured to be able to capture data even on the blind side of the object.